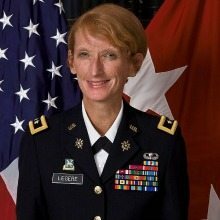 Lt. Gen. and Deputy Chief of Staff for Intelligence for the Army Mary A. Legere has joined Accenture Federal Services. She will be managing director for national and defense intelligence. Legere will be tasked with bringing Accenture’s global secure digital, mission analytics and agile development capabilities to national defense intelligence and cyber clients. Legere is the third high-ranking U.S. government official to join AFS recently. She follows Hal Smith, a former National Security Agency official who leads AFS’ intelligence practice, and Gus Hunt, former chief technology officer for the CIA who leads AFS’ cybersecurity practice. Legere has over 30 years of experience directing intelligence, security and cyber organizations, including the Army’s enterprise of 58,000 intelligence professionals in 140 countries and its 17,000-person U.S. Intelligence and Security Command. As the U.S. Army’s senior intelligence officer, she led the development and implementation of the Army’s multibillion-dollar strategic plan, increasing the Army’s intelligence, cyber and security capabilities while supporting complex multidiscipline operations across the globe. Legere holds a bachelor’s degree in political science and mass communication from the University of New Hampshire, a master’s degree in military arts and science from the U.S. Army Command and General Staff College, a master’s degree in strategy from the U.S. Army War College and an honorary doctorate of letters from UNH. Legere is a board member for several intelligence community associations.